Shop Fender Multi Stand 5 for Guitars from AMS and enjoy Fast & Free Shipping. 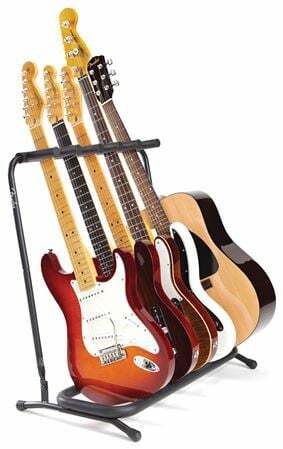 The Fender Multi Stand 5 keeps your acoustic, electric, and bass guitars readily at hand for ease and convenience. With its sturdy steel frame and finish-friendly foam padding, this multiple guitar stand is perfect for stage and studio alike. The five instrument model easily folds up neatly and compactly. Happy with my purchase ! Inexpensive, light-weight, and worth the small $$ to have all your guitars easily ready by your side. I still return my guitars to their cases when finished practicing. Wish that I had a 5th guitar, but I use the fifth separator to hang my cables. Probably okay if using in your house or studio. For road use it hasn't stood up to the task. Bolts constantly need tightening to keep from falling apart with constant folding & unfolding. Nice for home use but not really safe for live. Made well in China. Not hard to put together. Only thing that I wasn't expecting is there are no separators for the bottom of your guitars. You can bang them together and with 5 guitars on the rack the whammy bars are a close fit. Have to be very careful if you don't want to make your guitars relics. This is the first guitar rack that I didn't have to return because of damaged/missing parts. I can't give you a detailed review on this because it's a simple rack and does what it's supposed to do. Fits 5 guitars and holds them well, so I am more than pleased. Thanks again! Does what it says! Nice to have a place for some of the guitars around the room. Cushioned, folds, low cost... what more can be said. I wish I had bought one of this a long time ago! If you have multiple guitars, this is The Ticket for you. I have had my guitars lined up on single guitar stands for a long time. This single stand hold up to five guitars and I am amazed at the space I've saved, and we know that on a small stage area, space is a premium. The construction of this stand is good and with the added padding, it gives me a good feeling know someone cares as much as I do about my instruments. I liked it so much, I bought another one! I just bought my 5th guitar and need a place to set them up compared to all the gig bags, hard cases, and single stands as that takes up way to much room, so I checked out several stands and the Fender 5 guitar stand was more durable than and of the others I found and there were not that many out there. The price was right around the range I am willing to pay as for 5 guitars, it comes out about $15 cheaper than buying individual stands.